Beacon lights are designed to communicate with other motorists that added caution is needed around your vehicle. Del City offers a wide range of halogen and LED beacon light options with varying height profiles and base mountings. Beacon lights are ideal for utility vehicles, tow trucks, emergency, and construction vehicles. Emergency beacon lights are available in Class I, Class II, and Class II styles, as well as specialty low-intensity strobe beacons. Class I beacons are the brightest LED beacon light options available and are the primary warning lights for authorized emergency vehicles. 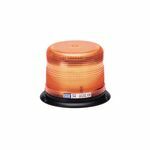 Class II beacons provide a mid-level intensity warning light commonly found on utility vehicles, while Class III beacons are a cost-effective design for typical caution vehicles. The low intensity LED beacon light options are a strobe warning light generally used on forklifts or other machinery used in a populated environment. Each LED beacon light is designed to produce light in many directions for a bright and effective warning to those around you. Customize, protect, and add visibility to your vehicle with a high quality halogen or LED beacon light from Del City.